Description: Scarlet Dragonflies with Ruby eyes dive downward against a cloud filled Aurora Midnight sky streaked with a full spectrum of colors. The exceptional stained art glass used in this family has unique tones in each piece, just as in nature. Each piece of glass is hand cut and copper foiled in the Tiffany tradition. 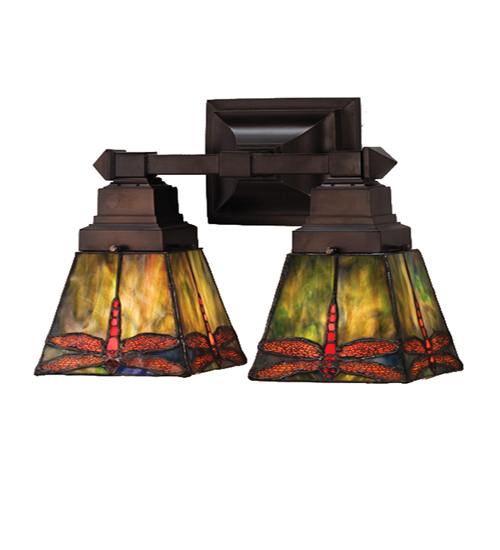 The Mission style square shades are suspended from a complimentary two light wall sconce in a Mahogany Bronze finish.